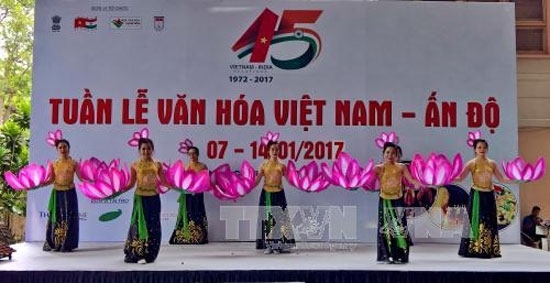 The Vietnam-India Culture Week was opened on January 7 in Ho Chi Minh City as an interesting start for celebration of the 45th anniversary of the Vietnam-India diplomatic ties and 10 years of bilateral strategic partnership. The week-long event include various activities, including a photo exhibition highlighting the friendship between the two countries, an exhibition introducing the nation and people of India, a Yoga day, a fashion show, an Indian film festival, and a food exhibition. Addressing the opening ceremony, Nguyen Van Manh, Vice President of the Vietnam Union of Friendship Organisations in Ho Chi Minh City, spotlighted the similarities of Vietnam and India in culture, history and religion. The traditional friendship between the two countries have been nurtured by leaders and people of both countries for years, with strong mutual trust and diverse cooperation between sectors and localities of both sides, benefiting both peoples, he said. Manh held that the Vietnam-India Culture Week will help introduce the culture, food, nation and people of India to locals in Ho Chi Minh City, thus strengthening mutual understanding between the two peoples and fostering the comprehensive strategic partnership between the two countries. 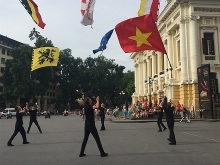 Meanwhile Smita Pant, Indian Consul General in Ho Chi Minh City, noted that Vietnamese and Indian people have set up their friendship and trade relations for thousands years, overcoming geographic distance to reinforce the sound brotherhood. She reviewed bilateral cooperation in politics, economy, culture, science and technology over the past years, as well as partnership in human resource development which contributes to the socio-economic growth of both countries.